Amy Rose (Japanese: エミー・ローズ) sometimes referred to by her nickname "Rosy the Rascal," is a character from the Sonic the Hedgehog series of video games and related media. Introduced in 1993, Amy was the first female character in the games, and is Sonic's self-proclaimed girlfriend. The classic Amy Rose design, as used in Sonic CD. Amy Rose is one of the few characters in the Sonic the Hedgehog series to have her start outside the games. The original design for Amy Rose was developed in the Sonic the Hedgehog manga published in Shogaku Yonensei. Written by Kenji Terada and illustrated by Sango Norimoto, the manga character was soon adapted by the Sonic the Hedgehog CD team to be used in Sonic's Mega CD debut. She was redesigned by Kazuyuki Hoshino, giving her a completely new dress and removing the mohawk-like hairstyle prominent in the manga, instead giving her a trim similar to Sonic the Hedgehog. Becoming the damsel in distress, she went largely unused after her initial appearance, showing up in a handful of spin-off titles. When Sonic Team reunited and started work on their three dimensional follow-up to the classic Sonic games, Sonic Adventure, it was decided they would revive the pink hedgehog and give her a starring role in the game. Yuji Uekawa, the man who would redesign all the classic characters, did the most drastic changes to Amy Rose. While Sonic, Tails, and Knuckles all received minor tweaks, Amy once again had her clothing and hairstyle completely revamped, and was also made to look slightly older, perhaps in an attempt to appeal to a different demographic than the rest of the Sonic characters. Sonic the Hedgehog rescues Amy Rose. From Sonic CD. It is implied that before the events of Sonic the Hedgehog CD, Amy Rose was already obsessed with Sonic the Hedgehog. Having always loved fortunes and other mystical practices, it only made sense that she would possess her own tarot cards. Using them, she was told that she was to have a "destined" encounter with Sonic on the Little Planet. Excited, she rushed over to Never Lake, the place where the small planet appears one month out of the year, and quickly made it to the terrain. It wasn't long before she ran into her crush, Sonic, in Palmtree Panic, and couldn't help but excitingly grabbing onto her hero, a fact he was none too pleased with. Her happiness was short lived, for as she continued to follow Sonic into Collision Chaos, she was kidnapped by Dr. Eggman's latest creation, Metal Sonic. Though Sonic eventually rescued Amy from her capture, and saved Little Planet from Eggman's grasp, he did not reciprocate Amy's advances. While she would try to become a part of Sonic's inner circle, it would not be until Eggman's attack on Station Square that Amy was able to become part of the main cast of the Sonic the Hedgehog series. The original unveiling of Amy Rose's redesign. From Sonic Adventure. 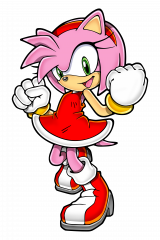 Amy Rose is a 12 year old pink hedgehog who has taken up residence in Central City, although her true origins are unknown. Most of her life is spent following Sonic the Hedgehog, whom she is obsessively in love with. While Sonic has never taken to her, it hasn't stopped Amy from declaring herself Sonic's girlfriend. Even though he has no romantic interest in her, and is sometimes overcome by her advances, Sonic and Amy are still able to be friends, even helping each other out if need be. Though her original game design was meant to look girly, her personality was meant to be the polar opposite of the cliche female video game co-star. She was meant to be a tomboy, feisty and not afraid to jump in and get her hands dirty. While she was unable to let this through in her debut, shades of this were present in her other appearances, such as Sonic the Fighters. However, while she's been able to shy away from the classic damsel-in-distress motif that she embraced in Sonic CD, she has also drifted away from her tomboyish nature, embracing such female cliches as shopping and fashion. In Sonic Battle, her attraction towards Boxercise plays to both elements of her ever-changing personality; the exercise helping her lose weight to maintain her girlish figure, and the boxing to help her train when she's forced to fight. While it is rarely shown in the games, every profile for Amy Rose has been sure to include her interest in mystical practices, such as tarot card reading (a guide for spiritual divination) and dowsing (a practice to find hidden water or gemstones). She is also quite fond of soft-serve ice cream, though no specific flavors have been hinted at. When forced to fight, Amy often goes into battle with her Piko Piko Hammer, an oversized weapon that magically materializes from out of nowhere. It has the ability to smash through whatever enemy robots might come her way, and was even used to finish off her would-be kidnapper in Sonic Adventure, ZERO. She can also spin in circles holding it out, attacking from all sides, though she will eventually get dizzy, unable to defend herself briefly. Amy can also use her own versions of the spin attack and spin dash if need be, but prefers to use her hammer. In later games, Amy has become extremely close to Cream the Rabbit, even having her live with her for a time during the events of Sonic Battle. Her easy-going friendly attitude has allowed her to befriend even the unlikeliest of the supporting cast, including Shadow the Hedgehog and Big the Cat. All in all, Amy is an extremely cheerful girl who tries to make everyone just as happy, even if she has to use her hammer to accomplish this. Just as with Sonic the Hedgehog, Amy Rose has been adapted into various media, each modifying her story to fit in with their established continuities. In the western version of the Sonic CD setup, Amy Rose is seen not appearing at Little Planet separately from Sonic, but in tow, Sonic not minding at all her company. As they reach the Little Planet, they find it chained to the planet Mobius, and Metal Sonic kidnaps her before they step foot onto Little Planet. It must be noted that while the European manual and all regions of the PC version call her Amy, the American manual changes her name to Princess Sally, in order to tie the game into the Saturday morning series. Nothing inside the game was changed to reflect that, and all future games featuring Amy released in North America kept her original name. The publication in which Amy Rose made her true debut, not much is known of her personality in the comic aside from the fact that she had already achieved what Amy has been striving for in the games - in a sense. Amy was the girlfriend of Nicky, a hedgehog who had the ability to transform into Sonic the Hedgehog. Since she was part of his alter-ego's life, its unknown how much she was featured, if at all, during the Sonic and Tails segments involving Dr. Eggman. Amy Rose and her evil doppelganger from the planet Moebius. Introduced in the 25th issue of Archie's Sonic the Hedgehog, Amy Rose was used in the comic's adaptation of the game Sonic the Hedgehog CD. In it, Dr. Robotnik captures Amy when he intercepts a letter meant for Sonic the Hedgehog, in which she declares herself his biggest fan. Sonic is forced to rescue her from the clutches of the doctor and his latest creation, Metal Sonic. After this encounter, Amy moved to Knothole, where she continued her support of Sonic, even during the "Mecha Madness" saga. Amy remained a minor character until Archie's adaptation of Sonic Adventure. Mandated by Sega to change her design from the classic Sonic CD look, an issue was dedicated to her aging four years in an instant through the help of the Ring of Acorns. Although she had aged physically, mentally she was still the same, and was denied entry into the Freedom Fighters, although she played a similar role in the adaptation as she did in the game proper. Eventually, Amy would become a full member of the Freedom Fighters, proving herself as a valuable member during the year long absence of Sonic. Through her time in the comic, Amy has also held the same love and obsession over Sonic as she does in the games, but unlike her game counterpart she has to deal with numerous other love interests for Sonic, including Princess Sally. Even still, she refuses to waver on her devotion to Sonic, although he sees her more as a sister than anything else. It must be noted that while Amy's nickname was used briefly in the series, it was later put into use from her counterpart on Moebius, home of the Anti-Freedom Fighters. Rosy the Rascal, having a design also tied to her original Sonic CD style, used the Ring of Acorns to age not for the sake of Sonic's attention, but because she hated him and wanted to find a way to defeat him. The introduction of Amy in Sonic the Comic followed the same basic premise as the games continuity, having her on the Little Planet seeking Sonic and subsequently being kidnapped by Metal Sonic. However, the comic embraced her tomboy attitude, making sure that even while she was kidnapped, she not be at the mercy of her captors. This was also exemplified in her choice of weaponry, a crossbow, predating the hammer of her video game counterpart. She was also one of the most visually dynamic of the core members of the Freedom Fighters, for the simple fact that her clothing would often change, her Sonic CD dress design abandoned early on. 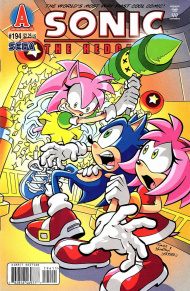 Amy would go on to become a major part of the Freedom Fighters, reaching the status of second in command, and being the leader when Sonic would disappear, such as in the build-up to issue 100 when he had to get his way back to Mobius through the Special Zone. One of the main authors of the strip, Nigel Kitching, would later go on record saying that he never played the Sonic/Amy relationship straight on, and was never clear on whether Amy had a genuine interest in Sonic, or would put on a show simply to see what kinds of reactions she would get from him. Produced under the supervision of Sonic Team, Sonic X has Amy Rose stick close to her video game personality. She uses her trusty Piko Piko Hammer to fight off Dr. Eggman's robots, and in her down time lives in the same complex as Chris Thorndyke and the rest of the Sonic gang that have been displaced from their homeworld. While she is Sonic's self-declared girlfriend, Sonic doesn't seem as weary of her in the series, and there are even the briefest of hints that he cares about her more than just a friend. However, Sonic refuses to ever admit such things, and through the series Amy tries time and again to get Sonic to notice her. The romantic aspect of the Sonic/Amy relationship is hinted at even more in the Archie comic series based on the show, when Sonic goes on a date with the pink hedgehog, albeit from a bet he lost with Knuckles. While at the end of the date their relationship remained as it does in the show, he says "maybe" in response to the question of whether or not he'd ever go on another date with her. Of all the core Sonic characters, Amy Rose has had one of the most drastic change when it has come to her age. When introduced in Sonic CD, her profile stated she was 8 years old. When she was redesigned and put into Sonic Adventure, she was aged four years, making her 12. This rapid aging was unique only to her, as Tails and Sonic remained virtually the same. 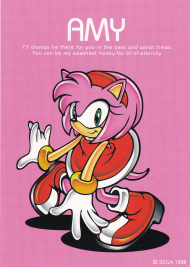 While Amy has never had her own game like her fellow starring brethren, she was able to headline the Sonic Cafe title Amy's American Page One, a card game released on Japanese cell phones. In an issue of Nintendo Power an article was featured on the "Top 12 Video Game Couples". Sonic and Amy came in at number 12, even though they mention themselves that they were never really in a couple. See Games featuring Amy Rose.